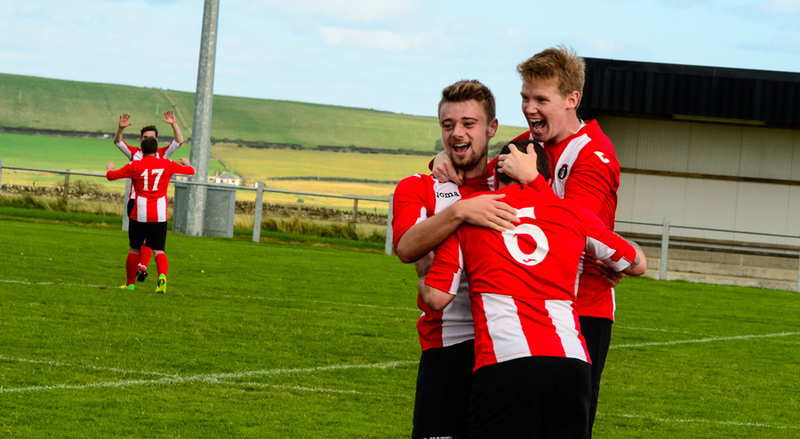 FOUR goals in the final ten minutes of the Football Times Cup first round meeting between St Duthus and Shetland resulted in both sides watching victory escape their grasp before the cruelty of spot kicks settled the affair. A brace from Liam Taylor and a screamer from Will Ross saw St Duthus lead the game going into injury time before a late Shetland goal sent the match to penalties. The well equipped setting of Morrison Park in Halkirk was the emergency venue for Shetland's visit to the Mainland as the 'home team' for their tie with St Duthus today. The Saints traveled with a fourteen man squad, introducing competitive debutants Garry Macleod, David Fraser and Scott Miller to the squad for the first time, along with loan signings Glen Fell and Liam Taylor. Trialist Ethan Bews was also named as a substitute. Of the two sides, Shetland looked more organised on the attack during the first half hour, threatening the Saints defence with a series of cross balls, but there was little to test Martin in the Tain goal, as the handful of crosses which reached their desired target were headed wide or dealt with ably by the Saints' back line of Skinner, Farquhar and Macleod. On the half hour mark, the Saints nearly broke the deadlock when the pacey Liam Taylor nipped in behind the Shetland defence and flicked a shot across the face of goal beating Grant Wood, but his effort bent just wide. Steven Martin then set the tone for what would turn into a great performance in goal with a save at his near post during a flurry of Shetland corners. Moments later he was forced into action again, this time tipping a goal bound effort onto his cross bar away to safety. A glorious chance fell for St Duthus, albeit fortuitously, when a long ball bounced over Wood in the Shetland goal and Glen Fell found himself through on an empty goal - but the full back was quickly crowded out by a group of onrushing defenders and the ball was cleared to safety. Good work from Jamie Skinner presented the Saints with their best first half chance with five minutes of the half remaining after the forward turned quickly to play Liam Taylor in on goal, but the striker's effort was closed down and saved by Wood. The second half began in the worst possible way for St Duthus, with Shetland netting after just two minutes. Receiving the simplest of cut backs from Greg Tulloch, Calvin Leask picked his spot before curling the ball past Martin to make it 1-0. Calamity followed as Ryan Grant doubled the Shelties' lead just a minute later tapping home from a James Aitken ball across the face of goal. The Saints were all at sea. Martin kept the score at 2-0 just moments later, saving a header from Richard Arthur at his near post before blocking a goal bound effort from Greg Tulloch. A clearance from Garry Macleod prevented another certain goal for Shetland as the ball clattered off the crossbar. A steady ten minutes of mayhem continued with the Saints' backs firmly against the wall. The introduction of competitive debutant Scotty Miller seemed to stem the flow of Shetland attacks as the Saints looked to pull a goal back, and within ten minutes they began to test Wood; Miller heading into the arms of the Shetland custodian with Tain's first chance of the half. At the other end, Macleod came to the rescue again as Shetland did everything but score before the defender blocked an effort on the line and the ball was deflected over the bar. Trialists Steven Learmont and Ethan Bews were introduced for the last twenty minutes of the game and their impact was felt quickly as St Duthus began to fight their way back in to the game. On 79 minutes, the hard working Macleod earned the Saints a penalty kick when he was tripped in the box. Loanee Liam Taylor then got off the mark for the club by dispatching the spot kick past Wood to reduce the deficit to 2-1. Three minutes later, Learmont did extremely well to break along the byline and cut back to Garry Macleod who fired a shot at the keeper. The defender forced a save but Taylor was on hand to knock home the rebound to score his and St Duthus's second of the afternoon to level the scores at 2-2. Scott Miller seemed certain to score when he broke clear of the Shetland defence on 86 minutes, but the striker's lobbed effort flew just over the bar. The best was saved for last. On 88 minutes, a cry of exultation from the Saints touchline rent the air as Will Ross let fly with a 25 yard strike that left Wood beaten. With Ross's goal, St Duthus had completed an eight minute turnaround of tremendous proportions to go 3-2 up and with only two minutes left on the clock, it looked as though they would advance to the quarter final. 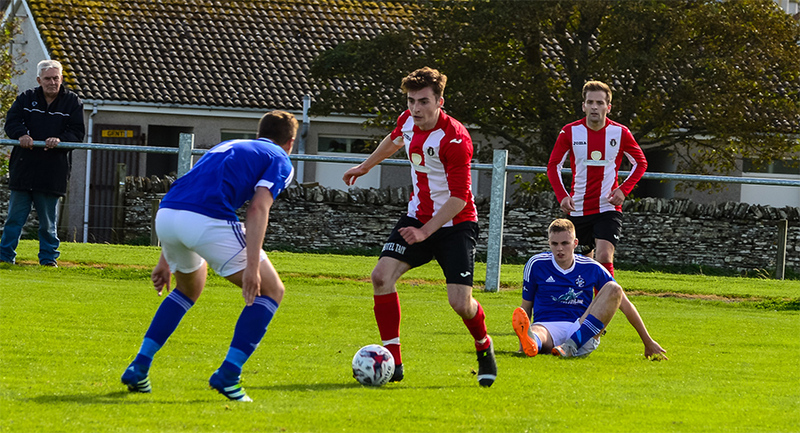 Heartbreak followed deep into stoppage time, however, when the Shetland men forced the Saints' line back with a series of corners and with almost the last kick of the ball, Jordan Thomason forced the ball over the line at Martin's near post. The game had been leveled and inevitably moved straight to penalties. Kicking the shoot-out off for the Saints, Scott Miller had his shot brilliantly saved by Wood, and from that point forward every other spot kick found the net. Inevitably, Shetland netted all five of their kicks and ran out 5-3 winners, despite the best efforts of Martin in the Tain goal. 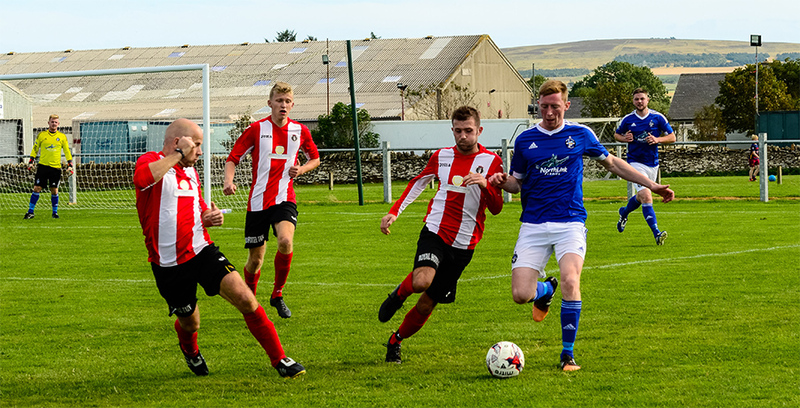 The shoot-out loss was a hard one to take for the Saints, who were just seconds away from victory in normal time - but Stuart and the side can be immensely proud of their fightback against a tough and talented Shetland side.